Well, you can't have everything! This should be put into a game- a very high quality one, not a cheap free online one. It would make an epic fighting is magic style, and it would be an epic vinyl scratch! Wow.. Sounds like a crazy huge thing you planning! Of course, do it! You have given me the sads. I will bombard you with banana planes. * jumps in front of cannon* BLAST ME BABY! GIVE ME DEM WUBUDUBDUBS!!!!!!!!!!! Okay, Burnin from Daft Punk can be used to not-shooting stage of the Cannon, don't know nothing about shooting music. Omg that is the AWESMEST bass cannon I've ever seen! .... I need to play again Saints Row 4. This is incredible like damn I love it so much! I was playing Dawn of the Beat from Tekken Tag Tournament and it fits so freaking well! shoots out 200,000,000 amp of dubstep. I want a fighting game with this sprite in it, that would be HYPE!!! Better than the dubstep gun in Saints Row. Power up the Bass Cannon. Initiate Phase I of epic mind-blowing Awesomeness. I was thinking more "RPG boss fight" than that. Ok... We have all of these cool Idle stances, and no game to go with them. This must be remedied! Love the spinning record on the back, nice touch! POWER UP THE BASS CANNON. 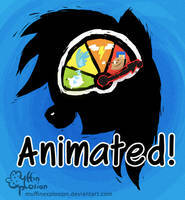 I was listening to "This Distance (Silva Hound Remix) (Final)" on Alicorn Radio. Vinyl's bobbing along to the beat. Same thing with Bassik's :Face 2 Face"
...maybe it's just a perception thing. "Oh it's nothing, just my, BASS CANNON!!" I want that so much!! I have seen a lot pictures of her with bass cannon but never saw an animation. This is so cool! Has a bit the type of the dubstep gun from saints row 4. good animation! This is going perfectly the Power Rangers theme I am currently listening too.